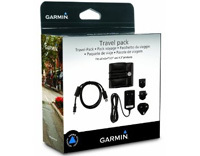 Garmin nüvi Accessory Travel Pack (010-11305-05) | Discount GPS Accessories from mysatnav.ie Ireland's leading GPS & Sat Nav store. Everything you need for you nüvi in a handy pack - a carrying case to protect your sat-nav, a home charger to keep the battery topped-up and in good condition, a USB cable to connect to yuur PC or Mac. Universal carrying case that stretches to fit both 3.5" and 4.3" display size.